An interesting study recently confirmed something sad that I have suspected for years: that despite the fact that humans are actively trying to protect whales in the North Atlantic, human culture and human lifestyles are so intrusive and damaging that we still end up killing whales. Human activity is still killing right whales, one of the most endangered animals in the ocean. An analysis of four decades of whale deaths shows that attempts to prevent them have not had a demonstrable impact. 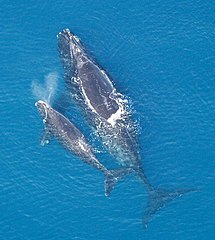 Only around 460 North Atlantic right whales (Eubalaena glacialis) are thought to be swimming the waters off the eastern seaboard of Canada and the United States. The governments of both countries have implemented several measures to protect whales from becoming entangled in fishing gear or being hit by ships, such as the US ‘ship strike rule’ that limits vessel speeds in certain areas. That rule came into force in 2008 and is due to expire next year. Marine-mammal researchers Julie van der Hoop and Michael Moore, both at the Woods Hole Oceanographic Institution in Woods Hole, Massachusetts, and their colleagues, analysed all known deaths of eight species of large whale in the northwest Atlantic between 1970 and 2009. During that time 122 right whales died, along with 473 humpbacks (Megaptera novaeangliae), 257 fin whales (Balaenoptera physalus) and scores of whales of other species. When the authors were able to assign a cause of death, ‘human interactions’ was the most common, appearing in 67% of cases. Entanglement in fishing gear was the main cause of death in this category. The protection measures seem to have had no impact on whale deaths, according to the study published online in Conservation Biology1. Although several of the rules were implemented only towards the end of the study period, Moore still admits that the finding is “hugely disappointing”. We can decry the age of whaling, in which humans were wiping whales out one after the other. But that was an age when the killing was both intentional and highly technological. It’s almost scarier to think that the way humans live today means that whales die, even though we (mostly) don’t want them to. In other words, there is something deeply wrong about the way in which we live today. The main culprit appears to be our fishing practices, which are egregious enough in terms of what they do to fish stocks, quite apart from how they affect whales (and all the other species which also become collateral damage). I feel the same way about industrial fishing as I do about industrial farming, though industrial fishing does not seem to attract the same intense opposition–perhaps because fish are not considered as intelligent and sentient as farm animals. But that certainly doesn’t mean that industrial fishing isn’t as environmentally shortsighted, and criminally wasteful (and in many instances it is cruel, as well). But whatever you think about the emotional lives of ocean fish, and the moral issues around killing them, it’s hard not to sympathize with whales that get entangled or killed by fishing equipment. And judging from the reaction of this humpback, anything we can do to further limit the damage to whales from fishing would be much appreciated.